The crackling warmth of a winter fire is a pleasure quickly ruined if your room fills with smoke. Choking smoke is liable to pour into your home, rather than up the chimney where it belongs, if you don't properly warm the flue. Smoke rises where it meets the least resistance. Warming the flue warms the chimney air, so the smoke will not meet resistance as it rises in the chimney. The Number 1 tip of warming a flue is ensuring the damper, the access point to the flue, is open. It sounds obvious, but people who forget to open the damper first will quickly experience a smoke-filled room and possibly weeks of airing out the odors. Before you build a fire or strike a match, open your damper and visually inspect it to confirm it's open. Some dampers open by pulling a chain, while others have a knob to turn. When it's open, you'll feel a rush of cool air in the fireplace and see an open vent. Use a flashlight to observe both the open and closed positions to double check that the damper is open before proceeding. Using a newspaper "torch" is an effective way to warm the flue. The torch not only lasts longer than a match, but can then be used to light the fire. Roll several sheets of paper lengthwise and twist one end closed. This keeps the smoke from traveling through the newspaper tube and into your face. Light the other end of the torch and hold it inside the fireplace. Move it slowly around the walls and let the flame touch the damper grate. When the flue is properly warmed, the smoke from the torch will travel straight up the chimney. 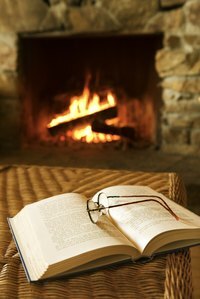 A lighter can also warm a fireplace flue in lieu of a newspaper torch. The long neck varieties used to light barbecues work especially well because your fingers are kept away from the flame. Stick your arm up into the fireplace near the damper and strike the lighter. Move the flame around the damper for several minutes. This method can take longer than the newspaper torch because the flame is smaller, but it is a good option if you don't have newspaper available. Your job isn't over once the flue is properly warmed; you still need to light the fire. It's helpful to build the fire before warming the flue. Then you can light the kindling immediately and get the fire going, so the flue doesn't have time to cool off first. Plus, you can use the newspaper torch or lighter to ignite the fire. How do I Convert a Real Fireplace to Electric? How Much Does it Cost Per Hour to Use My Gas Fireplace?